My little man is 3! It's just amazing how quick those three years have gone! This was taken a few days after Joseph was born, he weighs less than his birthweight here, under 600 grammes. 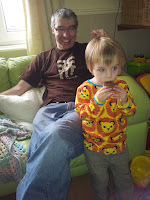 Inconceivable that my little man, not even a bag of sugar is now a big strapping lad of three! Joseph woke early, came down stairs on his own (he normally insists on being carried) and tackled a pile of presents! 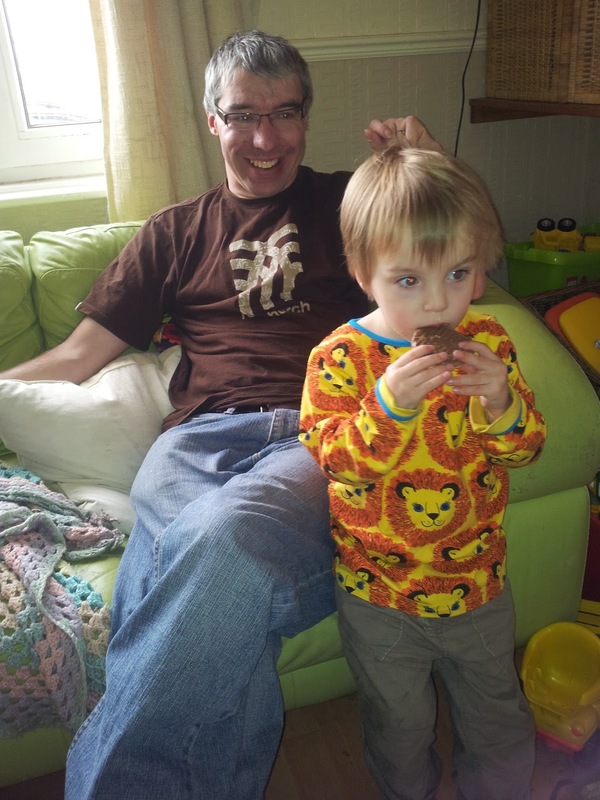 He received all sorts of things including this really lovely Smafolk top from Love it Love it Love it . I love the clothes Ruth stocks, and suggest that anyone with small people check her out! You have to follow the Twitter account too, Ruth is hilarious! But this post is really meant to be about the cake! 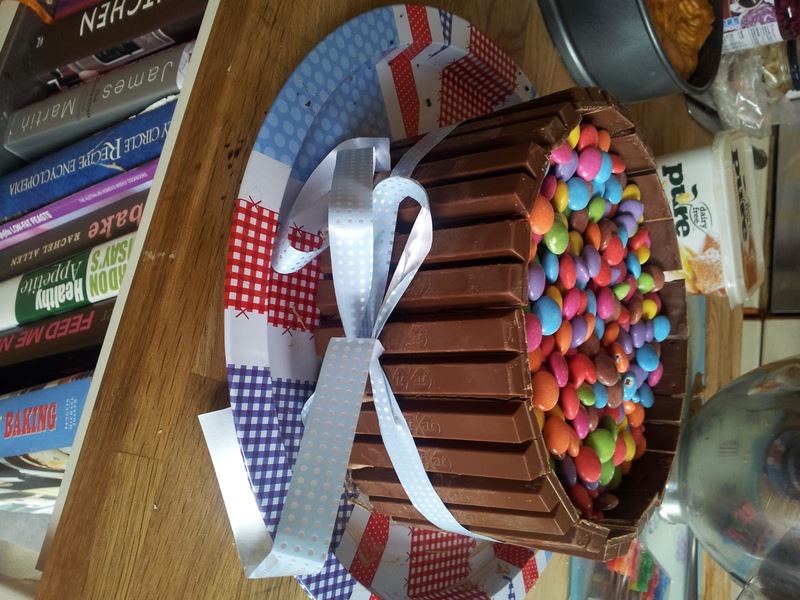 I found this cake when I first joined Pinterest and bookmarked it to make in the future. First I made a chocolate Victoria Sponge. I use the recipe from The Great British Book of Baking, leaving out 25g flour and substituting it with cocoa powder. I then made an industrial sized quantity of buttercream using this recipe doubled. 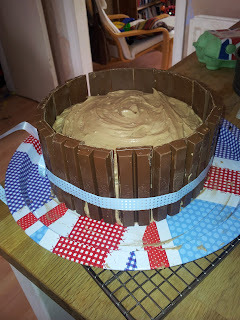 I made two sponges and then sandwiched them together, then coated with buttercream and put a kitkat fence around it. I tied ribbon around and this point to keep my fence up! Then I opened three packets of Smarties and tipped them in! The added the candles, and all done! This is the easiest cake I've ever made and it looks absolutely amazing, if I do say so myself! I'd highly recommend giving it a go for a birthday! Today is a happy day full of celebration. 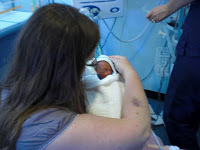 In the back of my mind, I feel a little sad, as this day marks the beginning, 3 years ago, of our 3 month hospital stay. But today isn't about that, it's all about the Joseph that he is now, a happy, strapping, cheeky lad. 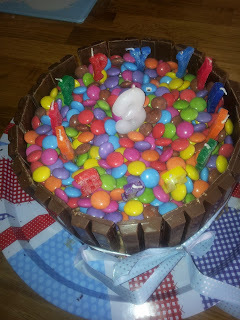 *Don't know why, but smarties and M&Ms are known as chocolate buns in this house! Happy Birthday to your lovely boy. 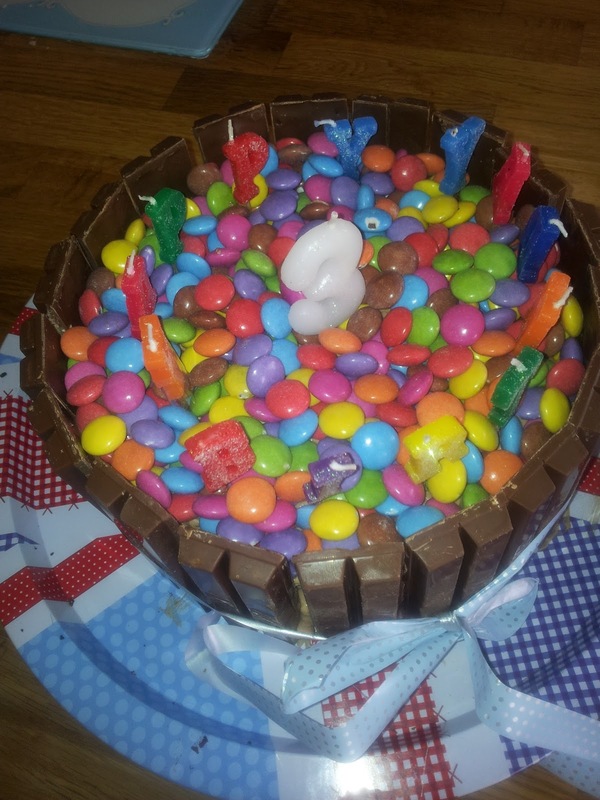 That us one fabulous cake!! Happy Birthday, J! Amazing what a strapping lad he is now, and working the lions look so stylishly. The cake looks awesome. I hope you had someone to hold your hair back after eating it!